Can a sport be considered as rare as an antique? Perhaps it can if the sport is ballooning, which has seen many ups and downs (pun definitely intended) due to the special nature of the sport and the scarcity of actual balloon manufacturers. I recently attended my first Great Balloon Race, which has been filling the skies over Reno, Nevada, with balloons since 1982. In its first year there were only 20 balloons. Reportedly, the average number of pilots attending the event has decreased in the past few years, but on the day I attended, I saw 87 billowing balloons take to the air. The Reno race is not an isolated occurrance. 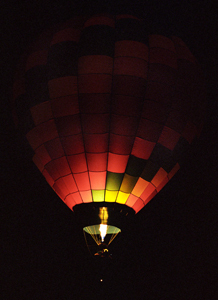 The Albuquerque International Balloon Fiesta started with 13 balloons in 1972 and is predicted to have 700-plus balloons in the air for this year’s flight. 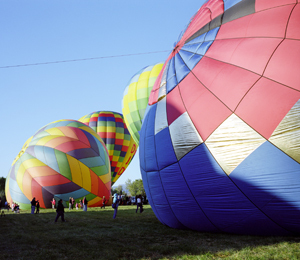 Balloon festivals also take place in many other states, including Mississippi, Missouri, and Texas. As I walked between the roar of the flames and the hum of the motors, I saw balloons rise like jellyfish floating to the surface of the ocean. It was hard for me to grasp that this event was actually a competition. The painterly sky, speckled with a rainbow of colors against the early orange light, seemed to be much more like performance art than a heated contest. The movement of the balloon is a collaboration between the pilot’s ability to read air currents and the force of the wind. This tension between human skill and natural forces makes for a more meditative experience for spectators on the ground, who can only marvel at the balloons floating over their heads. While football and rugby fans might be disappointed by the lack of testosterone and brute activity in this airy sport, there is plenty of drama to keep you on the edge of your seat—there’s more than meets the eye when it comes to flying a hot-air balloon. The Dawn Patrol starts things off before the sun shares its first rays with the vast Nevada desert. Those of us on the ground are given a light show by the fires illuminating each of the five balloons in a sequence that mimics the rhythms of a dance; there is even accompanying music. Then, off they go, guided by special navigation lights attached to their baskets, out into the deep black sky to report their observations of wind currents, to make weather predictions, and to relay elevation measurements to the pilots. This sort of information is key to the art of ballooning. It’s a bit like attending a live auction—the changing winds are like a rival bidder, injecting unpredictability into an otherwise orderly affair. Pilots must know how to react and maneuver their balloons through a variety of conditions which they encounter literally on the fly. As pilot Greg Taggart said, “It’s not just a sport, it’s an art and a science.” This mix seems just fine with the small and unique community of balloon pilots. “It brings me joy,” Taggart adds, “and I enjoy sharing that joy with other people.” Those who stay in the sport are uniformly passionate about it. They’re people just like Greg, who didn’t expect to still be ballooning 30 years after their first ride. Hey collectors: sound familiar? Maribeth…Such an artful work of prose! I love the way you’ve made the connections between the auction and ballooning. 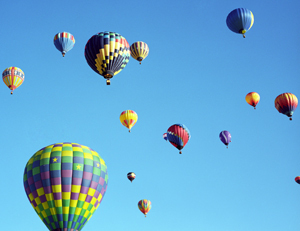 The beauty of hot air balloons always raises my awe and joy. Thanks for your post. Great article, Maribeth. Loved the pictures, too. Really enjoyed it. Thanks for sending it to us Adrienne. “ ” With love tokens, emotion can be felt in the palm of one’s hand.